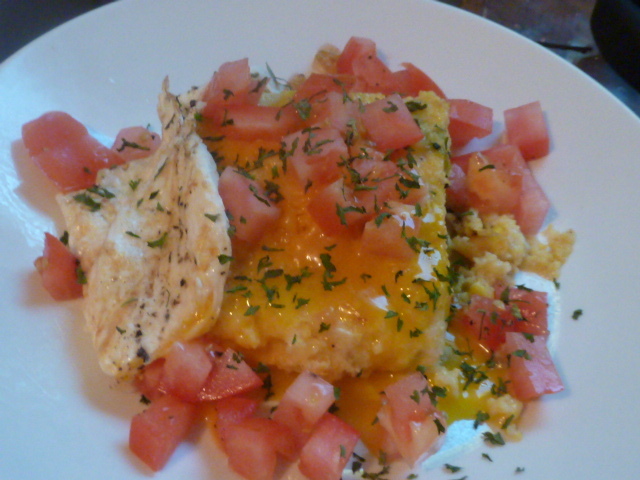 Topped with an egg, pan-fried polenta is my favorite brunch food. We ate this for dinner (who doesn’t love breakfast for dinner now and again? ), but this summer the concept is something I ate as a late breakfast about three days a week and never tired of. I love the way the yolk of the egg combines with the creaminess of the polenta. The mild heat of the chilies and the cool acidity of the tomatoes worked wonderfully together in this particular dish. 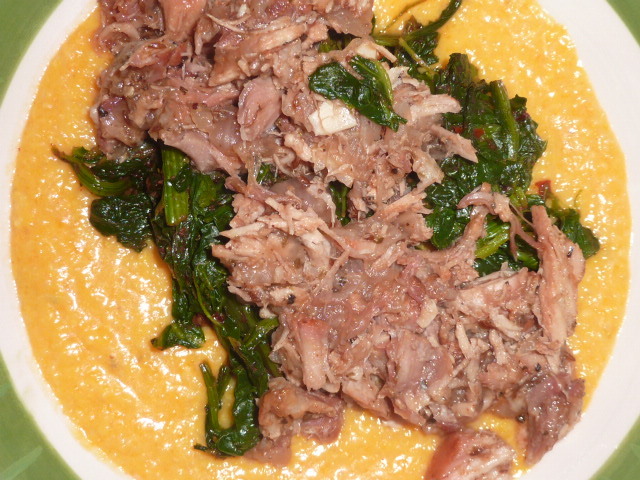 The polenta is a tad time-consuming, but the rest of it takes about ten minutes and the polenta can be prepared ahead of time. In a large saucepan, heat 1 tbs. of Brummel & Brown over medium heat. Sauté garlic until well-browned. Add five cups water and reserved juice from the chilies and bring to a simmer. 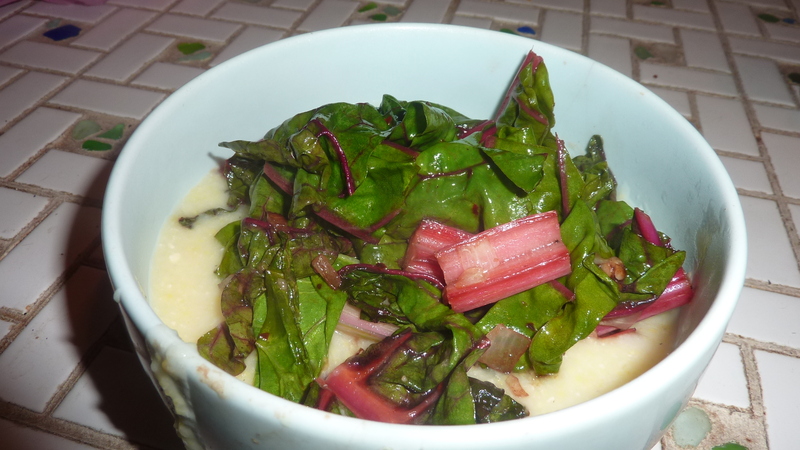 Slowly whisk in two cups of polenta and reduce heat to medium-low or to maintain a slow simmer. When most of water is absorbed, add the cumin, sour cream, garlic hot sauce, and cup of milk. Simmer, stirring frequently, over low heat roughly 15-20 minutes. When polenta is nearly done, add diced green chilies and corn. Simmer another five minutes or so until polenta is cooked through and corn and chilies are heated. Spray a large casserole with non-stick spray. Pour polenta into the casserole dish and smooth with a large spoon. Let cool. Once cool, place in refrigerator for 2-3 hours until solid. In a large skillet, heat olive oil over medium-high heat. 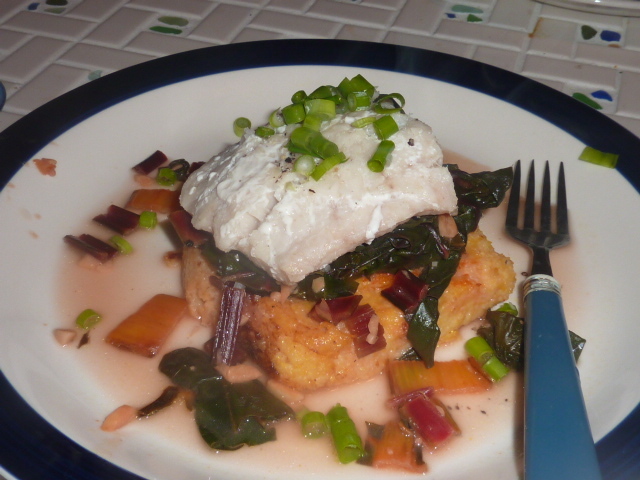 Add two slices of polenta from casserole (roughly 4″ square) and fry 5-6 minutes per side until golden brown. Once golden brown, top each slice with 1/2 of shredded cheddar cheese and cover skillet. Steam cheese until melted, roughly 1-2 minutes. Meanwhile, in a small skillet, heat remaining tablespoon of Brummel & Brown. Fry two eggs, seasoned with freshly cracked black pepper, roughly 1-2 minutes per side, until over-easy or to taste. Serve fried polenta slices topped with diced tomato and fried egg and garnish with dried parsley.